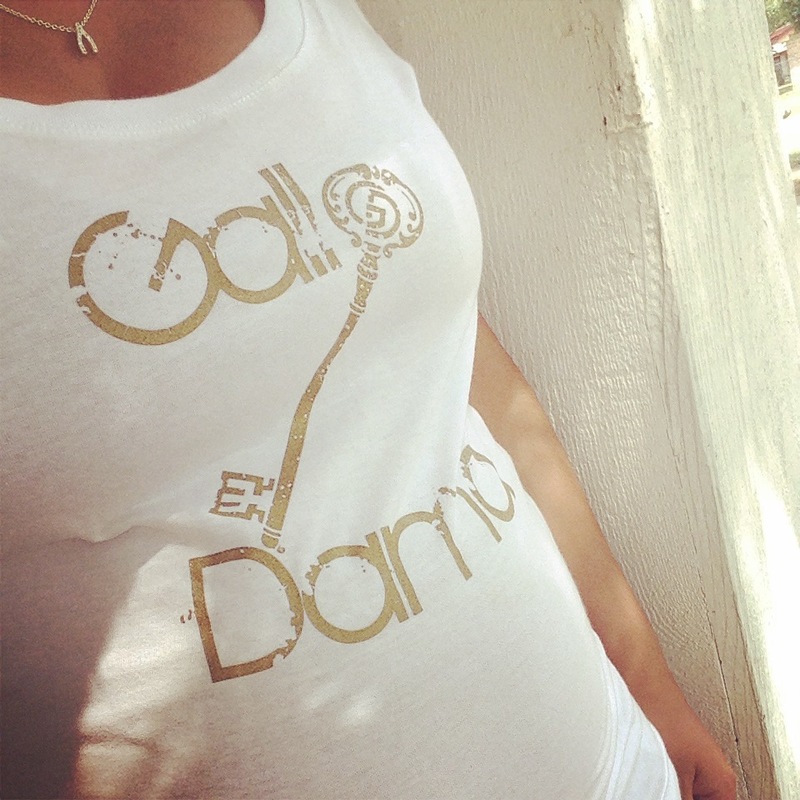 My baby bump had just started to sprout around 4 months and I was excited to sport my Gallo y Dama White scoop neck tee. My husband and I started Gallo y Dama, a line of provisions ranging from clothing, accessories and more on a leap of faith through God. We were on a path to being greater and following our dreams together. Our church, Life Point was a positive influence on helping us discover our paths to discovery and to strengthening our marriage. We wanted a brand that would represent our faith, that was bold, that represented the man and the woman together and that reflected our style. We have known each other since middle school and have always enjoyed wearing complimentary outfits and colors. It was on our journey in the designing process that we found God in a greater way we would have never known if we never put our depths in giving Him the glory in all we do. We figured we wear brands that represent other designers that others may idolize but we wanted to wear something that represented something we believe in and that would give God the glory. Gallo y Dama’s name is unique and the logo is quite bold but that was our point, to spark conversation with other’s, for strangers out in passing at the mall or at a restaurant or park or wherever to read it and become curious to look it up or ask us about it. It’s the one conversation we as Christian’s long to spark up but we never want to intrude or make someone feel uncomfortable about it. If one ask’s us about it then it makes it easier to share our story of faith. That person might be lost, might have been going through a struggle or might have just needed to hear the name of God and our story of faith to give them hope and that is our mission. We have been blessed to have known each other since middle school and have gone through our ups and downs of learning each other and strengthening our relationship in marriage through Christ. We want to give others inspiration and hope that love is real, it is hard work, it is beautiful and it is about putting God first before each other. We found out in May we were having a baby and we were just ecstatic. Wearing my Gallo y Dama shirt with my baby bump brings me joy to know that we are blessed and can bless others with our story. Our story for you is that we want you to know that you are loved, you are beautiful and you hold the key to your dreams just seek God to unlock them. Go on this journey with us.